We welcome you, storytellers, burgeoning and experienced, to join us for a low-key social! Meet and mingle with fellow local tellers and our visiting tellers from British Columbia, Anne Glover and Shoshana Litman. We’ll have a cash bar and delicious catering from Rocket Bakery. It’s a fantastic opportunity to share stories one on one in a warm and casual atmosphere. 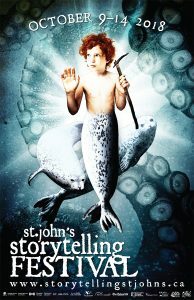 Then stick around for the first festival event: The Story Circle, hosted by Kelly Russell! Come eat, drink, and gab with us! We’re launching the festival with one of our of most popular events: the Storytelling Circle! Hosted by Kelly Russell and featuring local teller Sharon King-Campbell and the marvellous string-stories of Anne Glover (BC). Feeling brave? Join us on stage for the open mic! We’ve moved to a new and larger venue this year, so bring all your friends! Delightful tales of triumph provide encouragement and joy. Experience traditional tales offering wonderful insights about the power of words to heal or to destroy, the resilience of compassionate people and the transformation of even the cruelest king. Narratives from Shoshana’s well-travelled life help weave the stories together. Original melodies, catchy phrases and provocative questions invite audience participation in the spellbinding experiences Shoshana creates. Join us for tales of sails at Ships at The Ship! We team up with the NL Folk Arts Society to bring you riveting tales of life on the sea: pirate-laden adventures, harrowing shipwrecks, and heartfelt memories of sailors past. Hosted by Randy Crane and featuring Jim Payne, Christine Hennebury, Dave Paddon, Eugene Kane and Lynn Hamilton McShane! Have a sail of tale? Tell it during the open mic! Elizabeth Penashue shares moving stories from her life as an environmental activist and defender of Innu culture. Alternating between traditional tales and personal experience, the private and the political, this will be a special change to share space with a truly incredible woman. WORKSHOP for Educators, Parents, and the Young at Heart: Anne Glover’s String Stories! Entrance from the back, 42 Bannerman St. In this hands-on workshop, participants will learn string stories they can use right away in programs for children and youth. Anne travels the globe teaching string stories to even those who are “all thumbs.” String stories can be used in story time, puppet shows, after-school programming, and as a visual/kinesthetic link to literacy. All you need to bring is yourself and a sense of humour! No strings attached and no dexterity required! Hands-on, action-packed, fun and funny. Your shoelaces will never look the same! Anne intertwines multicultural tales with string figures from cultures around the globe. From Tokyo to Tofino and Burns Lake to Buenos Aires, Anne has spent years enchanting audiences and inspiring a generation with her unique string-stories. Don’t miss this chance to work with this polished entertainer and gifted, engaging teacher. For some reason, Newfoundland has more ghosts than almost anywhere else…and what a better place to hear them than the Newman Wine Vaults. Creep through barrens, lighthouses, seabeds, and even kitchen parties with Charis Cotter and Dale Jarvis, the experts in spooky! Enjoy a sample of Newman Wine Vaults port and some delicious nibbles while you take in this special event. STORIES FOR KIDS: Spectacular String Stories with ANNE GLOVER! Anne Glover brings her stories to life with wild and wonderful string games! She is often asked what kinds of spectacular things she can make with strings. Airplanes? Yup. Dragons? Yup. A horse with a person on its back riding all the way through the universe and bumping into a dinosaur with a griffin on its back, driving a car? You bet! Her fabulous, fun-filled stories are a treat for the whole family! This event will open with performances by young tellers Benjamin Wright and Julianne Taylor. **Please note: The entrance to the Annex space is around the side of the Visitor Centre. If you are pulling up in a car, drive past the main entrance and you will see a smaller attached building on the side, with a paved path down to the entrance. The path will be marked with small lanterns. Join us for a warm and wonderful evening of tales and recitations woven in rural Newfoundland and Labrador. Journey through Labrador fishing for char, getting caught in snowstorms, and embarking on long winter walks; relive resettlement stories and connect with rural roots. Hosted by Marion Counsel and featuring Angus Andersen, Elizabeth Penashue, Hubert Furey, and Peter Laracy. This is a fan favourite and always a highlight of the festival! Entrance from the back, 42 Banner St.
Shoshana shares some of the wisdom she’s learned from 20 years of professional storytelling. This inspiring workshop features easy to remember breathing, movement and vocal exercises. These tips help invigorate verbal artists, enhancing their ability to tell lively tales and provide memorable performances. Intended for beginning and more experienced storytellers who want to enliven their storytelling with exercises they can practice at home or on the road. Discover trails and tales of enchantment in forests, gardens, ponds and fairy lands; join Jack on a wild adventure, and share traditional Inuit tales from Nunavut. Host Catherine Wright and featured tellers Anne Glover, Chris Driedzic, Ashley Savard, and Mary Fearon will take you on a tour of the imagination during this story walk inspired by nature. Hop a train through India, share the magic of traditional Inuit tales, revel in contemporary throat singing, and be inspired by poetic prose in an incredibly unique evening of storytelling. Hosted by Fergus O’Byrne and featuring Gaurav Madan (India/NL), Tama Fost (NL), Daze Jeffries (NL), Ashley Savard (NU), Anne Glover (BC), and Shoshana Litman (BC). A great opportunity to see how big and how small the world can be! Have you ever told someone what you did, or about a great or terrible meal, or anything from your own experiences? Then you are a storyteller and this workshop can help you craft memorable tales. Shoshana models easy to tell stories for young people who want to discover more about storytelling. She fills your toolbox with step by step instructions and fun storytelling techniques. You can practice these techniques with another participant or the whole class, or just come and listen! Perfect for any kids interested in drama, acting, or writing stories. Explore the world with delightful stories, engaging melodies and fun sound effects. Enjoy the adventures of a boy who saves Szechuan, China from drought in the “Dragon’s Pearl” and a girl who saves the world with music in “Frida’s Flute.” Sing along with intrepid animals and people in the “Magic Tree” of Africa and the “Noisy House” of Poland. Shoshana’s tales take you to amazing places and bring you home again, happy and ready for more! This event will be opened by performances from young tellers Sophie Shoemaker and Gwen Brokenshire. Award-winning performer Anne Glover will regale Francophone audiences with two programs on October 17. At 11:00, toddlers and parents can hear and see her magical and versatile “string stories” in a bilingual program. Then at 1:25, Anne will perform in French for the students of École des Grands Vents. Hello fabulous storytellers and listeners!